Player-coach Andrew Lord has hailed Cardiff Devils' "special group" after they secured a place in the Challenge Cup final. 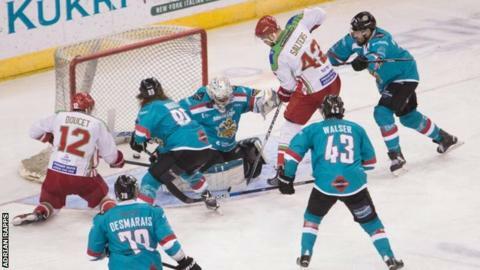 Holders Devils beat Belfast Giants 3-1 in the semi-final second leg to complete an 8-4 aggregate victory. The win kept Cardiff on course for a league and cup double and Lord says that is down to his squad's character. "I was part of a great group last year but I think this group, to a man, is something special," Lord said. "We don't want to look too far ahead but the big thing that we have going for our group is that we're really enjoying the process. "I'm very lucky as a coach to have that." Devils will face Sheffield Steelers or Nottingham Panthers away in the Challenge Cup final on Sunday, 6 March. Panthers lead 8-0 on aggregate ahead of Wednesday's second leg. Devils are two points clear of the Steelers at the top of the Elite League having lost 5-4 to their title rivals on Sunday.